In 1980 Audi set the ball rolling with fast four wheel drive production cars with the Audi Quattro, until then 4WD had been a specialised product only appearing on motorsport cars (Ford produced a 4WD Capri for rallycross in the late sixties plus Zodiac and Mustang research cars). Before long many other manufacturers saw a niche in the market for 4WD cars including Ford. Bob Lutz the then chairman of Ford of Europe decided that Ford's Special Vehicle Engineering department (SVE) would produce a 4WD Sierra. Originally this was to be based around a 2.3 Ghia but this was quickly dropped in favour of a 2.8 powered car based around the XR4i. 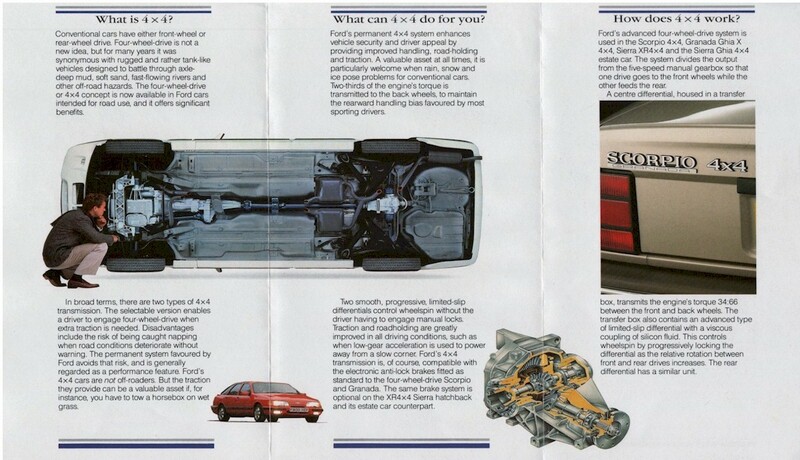 The intention was to produce a car that could be sold alongside the XR4i rather than a replacement. This never happened as the XR4i was dropped and the XR4x4 was born. At the same time Ford also developed anti-lock brakes for the Sierra range, this didn't appear on production cars until 1986. The 4WD system was based around the Ferguson/FF system with 34% drive at the front and 66% at the rear. This allowed conventional drive to the rear wheels, drive to the front was provided by a propshaft running to a front differential with drive shafts attached left and right. SVE also decided that the suspension from the XR4i could be beefed up and improved giving an improved ride quality and far better handling. This was done by lowering the ride height, stiffer springs, beefier rear anti-roll bar and uprated shock absorbers. Original development took place on three door and five door bodyshells. A few hundred three door cars were built but never sold in the UK. These were based upon the XR4i shell and were all left hand drive. It was decided that power steering, four wheel disc brakes and alloy wheels would be standard. At the same time it was decided that trim levels would be reduced so that the purchase cost would not be too high. This meant no piping on the seats, no plastic cladding on the sides of the car and only a single boot spoiler. The sunroof to start of would be an optional extra. Spring 1982 - SVE started to develop a 4WD Sierra. Spring 1983 - XR4i launched. March 1985 - XR4x4 first shown at Geneva Motor Show. April 1986 - 4x4 Ghia Estate launched. June 1986 - XR4x4 launched. October 1986 - ABS becomes standard. February 1987 - Mark Two body style launched. 1988 - 4x4 Estate launched. January 1989 - 2.8i engine replaced with 2.9i. April 1989 - Sierra GLS 4x4 launched. January 1990 - Facelift to whole Sierra range. 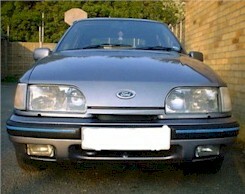 January 1990 - 2.0i XR4x4 launched. January 1990 - 2.9i 4x4 Ghia Estate dropped from range and replaced by 2.0i 4x4 Estate. August 1991 - Interior trim updated. 1992 - Minker 323 launched. 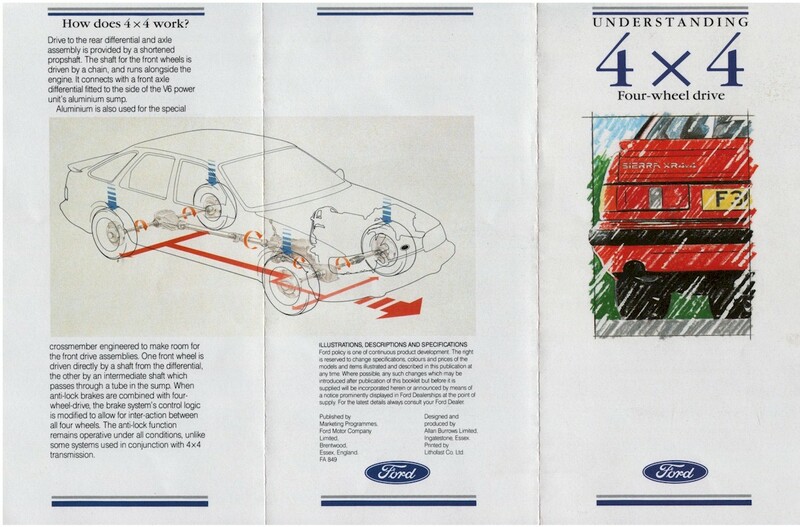 January 1993 - XR4x4 production discontinued. 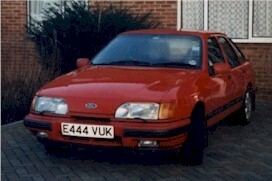 April 1993 - Production of Sierra ceased to be replaced by the Mondeo. These figures are only approximations as Ford do not keep production records for each model made. They are also figures relating to registration of vehicles not build dates, this accounts for some model types overlapping.